The trend for outdoor living has led to a growing market for large balconies, roof/ground terraces and patios with variations in design, and larger installations are no longer reserved for large scale commercial buildings such as hotels and sporting venues. With the right construction, useable outdoor spaces can be created for year- round enjoyment. While traditional decking systems are easy and cheap to install, it requires ongoing treatment to maintain colour and quality, while untreated softwood decking may be susceptible to water damage and/or rotting making it potentially dangerous when loaded and used at heights. Tiles make a great alternative to decking on balconies, particularly as it’s far easier to create the seamless inside-outside look that many people yearn for. Plus, they can be easier to maintain, more durable and can be used at any time in any weathers. Many types of tile finishes are available when specified with the correct system assemblies, ranging from ceramic to porcelain, to some natural stone and pavers. The inside-outside look is easy to achieve, particularly with the use of certain tiles that are suitable both internally and externally and the inclusion of barrier-free entrances. The issue with external tiling has always been the build-up – specifying the right construction assembly, screed, waterproofing, drainage, adhesive and of course the right tiles with suitable slip- resistance and ability to cope with all weather conditions. Many tiled balconies have failed because of the inferior quality of construction, where water has penetrated the surface layer and caused a whole host of problems. The ingress of water, combined with fluctuations in temperature, can cause considerable damage to the tiled surface and potentially the substrate, including freeze-thaw damage, cracking tiles, efflorescence, joint erosion and stained tiles. 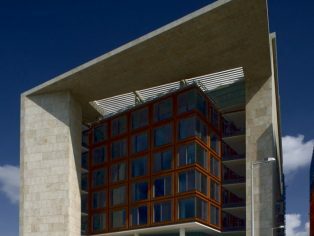 In extreme circumstances, if water penetrates the primary waterproofing layer and is trapped in the construction, it can cause erosion and complete failure – especially if the erosion takes places at balcony connections. 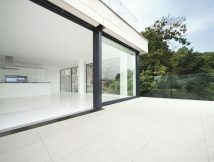 This is particularly the case with traditional thick screed cement-based systems, as these are typically more absorbent and will retain more water – taking longer to dry out and providing more of an opportunity for the creation of soluble salts, voids, and lime bloom. That is why British Standards state that water must be removed from the various layers of a cement-based system rapidly and efficiently. Other systems for fixing external tiles include gravel beds and adhesive pedestals, but these are not infallible either. Issues arise such as weed growth and moisture staining as water travels back up the adhesive or grit, and into the tiled surface. The challenge then is to ensure proper provision in your designs for the drainage of surface water causes no long-term damage. This means looking carefully at the whole external system and specifying the correct combination of materials to include; effective and working falls, drainage systems, non-absorbent backgrounds that are fluctuations in temperature, as well as correct fixing materials and low-porosity, break-proof tiles and slabs that are certified for external use. One such system that has been proven to work is a combined drainage screed and capillary passive drainage mat. Cavity rich – containing lots of capillaries – the water drains through quickly and efficiently and offers reduced shrinkage and deformation. When combined with quick-setting cement for fast-track installation, drainage mortar seems the ideal solution, however drainage screeds alone will not solve the problems with drainage. The use of a complete drainage system – including drainage matting, drip/drain edge profiles, drain grates and guttering – provides rapid and immediate drainage of water. This means the water cannot enter the screed and cause issues such as freeze/thaw damage, staining, cracking and efflorescence. Widely used on the continent, the drainage mat and drainage screed system has even become standard in Germany since 2002, being incorporated into the standards for external floor coverings of the German Construction Industry Association (ZDB). When working at height, there are often weight loading and height build-up issues – this is particularly problematic when trying to create threshold-free junctions for a seamless inside-outside look. This can be overcome with an epoxy resin-bonded screed system or with a point-fixed system. When used in combination with a drainage mat, the epoxy drainage mortar system can be used for various tile types and thicknesses. Strong and lightweight, build-up can be achieved from only 43 mm for low height constructions. It is ‘capillary- passive,’ meaning the water travels down through the screed system and is transported to the drip/drain profiles and guttering via a drainage mat. Primarily used for low construction heights, and areas with reduced clearances, the direct point adhesion system is up to 80 per cent lighter than conventional assemblies. Complete build-up can be achieved from 29 mm (when using a 20 mm slab and 8 mm drainage mat) – saving 70 per cent of the overall construction height. The assembly ensures rapid-drainage for barrier-free/low door connections using low-height drain grates. To achieve a seamless inside-outside construction it is important to specify the right drain grates and drip/drain edge profiles – without them water can seep over balcony edges causing unseemly discolouration and potential metal erosion of balustrades. Consider specifying drain grates that are height adjustable and flexible with integral dirt traps – this means that water is free flowing through the drain grate and drainage. Ensure that they are standard compliant for door threshold heights from 150 mm to 50 mm. Drain grates are also essential at balcony junctions as they help prevent backflow into properties. 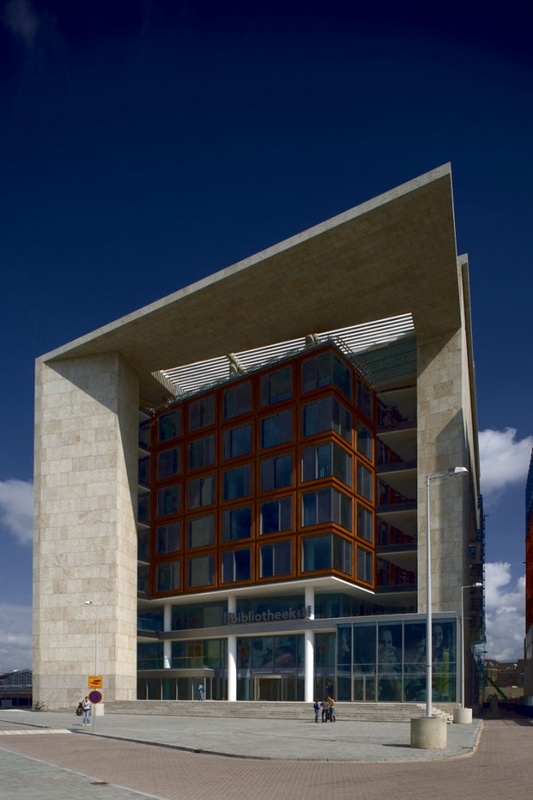 The entrance area to Amsterdam Library was tiled with limestone laid on top of the AquaDrain EK drainage mat system now available in the UK from BAL. Seamless transitions for inside-outside tiling can be easily achieved with BAL External Tiling Solutions.